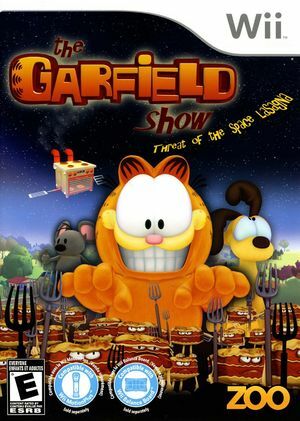 The Garfield Show: Threat of the Space Lasagna is a Wii video game based on the Cartoon Network television series The Garfield Show. Space Lasagnas are preparing to invade the Earth! They will first have to neutralize their most terrible opponent: the endlessly hungry Garfield. Thanks to their mighty hypnotizing laser, the Lasagnas turn the mice completely mad. The mice become crazy and start invading the whole city, causing chaos everywhere. The only way for Garfield to wash the hypnosis away is to beat the mice down. To do so, Garfield will chase the mice into Jon's house, Vito's pizzeria and even the butcher's shop in order to teach the mice a good lesson. Garfield has to do all he can to thwart the Lasagnas' plans and eradicate the threat of the Space Lasagnas. Game soft locks with black screen when selecting a game in the story mode. The graph below charts the compatibility with The Garfield Show: Threat of the Space Lasagna since Dolphin's 2.0 release, listing revisions only where a compatibility change occurred.